Scroll down to see the Shape of My Story. The idea that stories have a shape is not mine. Renowned author Kurt Vonnegut famously categorized the world’s most effective narratives into visual graphics where each milestone for a character moved the reader along on a familiar track. 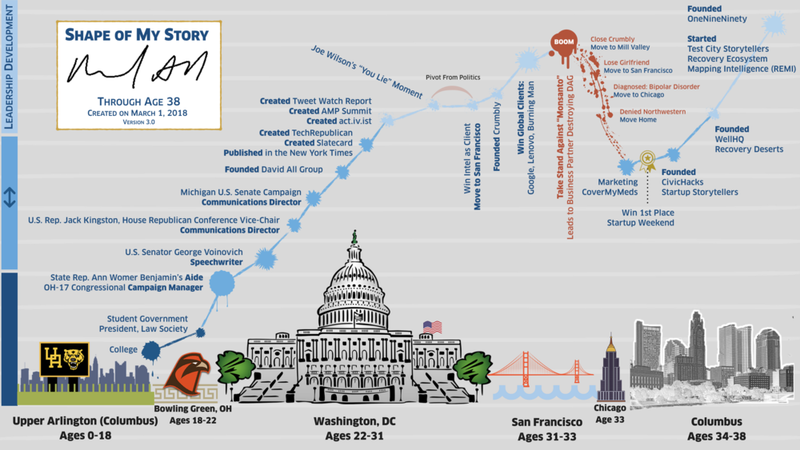 While Vonnegut categorized fictional narratives into shapes, author Bill George in Discover Your True North created a simple story graphic based on his research interviewing top leaders in the world about their road to authentic leadership. Real people that were great leaders had personal and professional stories that had a similar shape. Discovering George’s work changed my life because it provided insight into where I was on my path to being an authentic leader. At the moment when I read his book, I was at the depth of my own greatest personal and professional “Crucible.” But while I thought I was lost, I was actually on the path to becoming the leader I am today (if my goal and path in life is to be a great leader). This key insight led me to begin the process of self-reflecting on my own path, coming to terms with the decisions that led me to where I was at the time, and ultimately transforming into being a better leader. I emerged truly grateful for my own Crucible, and finding ways to help others discover the value of life’s Crucible. Over the past few years, I have been building on the work of these two story-shapers to create my own (auto-)biographical contribution; I call it the StoryShape.